Noni fruit (scientific name: morinda citrifolia) is also known as nunaakai (Tamil Nadu, India), great morinda, Indian mulberry, dog dumpling (Barbados), apatot (Philippines), mengkudu (Indonesia and Malaysia), pace (Java), kumudu (Bali), cheese fruit, beach mulberry, or noni (Hawaii). The noni fruit is native to Australasia and Southeast Asia. It belongs to the family of Rubiaceae, the coffee family. It is considered the “Queen of the Morinda”, thanks to its versatile nature, important attributes, and the distinctive ability to spread itself on the beaches without requiring much human intervention. This fruit is green when unripe, and turns yellow when it ripens. It is oval in shape and measures an average of 10 to 18 cm (about 4 to 7 inches). When ripening on the tree, the noni fruit gives out a pungent odor, hence it’s also known as cheese fruit or even vomit fruit. Needless to say, the smell of the fruit attracts fruit bats and fruit flies that feed exclusively on these fruits. The noni fruit is commonly used to make juice as well as other preparations such as powders, tablets, capsules, and teas in order for consumers to enjoy of its rich health benefits without having to deal with the odor. Noni fruit is rich in minerals, vitamins and many phytonutrients. Minerals content of noni fruit include potassium, calcium, magnesium, phosphorus, and iron. It contains almost the entire range of vitamins: A C, E, and of the B vitamins: B1, B2, B3, B5, B6, B9 (folate) B12 and beta-carotene. Along with that, it also contains many known phytonutrients that are antioxidants: vanillin, quercetin, pinoresinol, kaempferol, proxeronine, isoscopoletin, and bisdemethylpinoresinol. Antidepressant/Sedative: Noni is useful in facilitating two critical hormones—serotonin and melatonin respectively. Melatonin helps to regulate the circadian rhythm, thus helping you to sleep. Keeping this regular helps you get quality sleep and improve your mood. Serotonin, on the other hand, affects mood, sleep, and emotion. Imbalanced levels of serotonin can cause depression. Antipsychotic Agent: Noni fruit may be beneficial for various disorders and ailments related to the central nervous system. It can treat psychiatric disorders because it owns anti-psychotic properties. Besides, the therapeutic properties present in it work well to deal with brain damage. Cardiovascular Ailments: Noni fruit has vasodilator properties that help to regulate blood pressure and maintain heart health. It additionally supports the cardiovascular health and regulate the overall cholesterol levels in the body. Diarrhea Treatment: Salmonella and E. Coli are two bacteria that can cause diarrhea. Noni fruit composes of antibacterial agents, which can combat these bacteria in the body. This fruit is far more effective for curing diarrhea caused by bacteria, than prescribed antibiotics or drugs. Fight Infections: Fungus and bacteria can infect the body from the outside or inside. Regular consumption of noni fruit can fight against bacteria inside the body. Also, it is helpful for treating skin conditions caused by bacteria and fungus. Immune System Booster: Noni fruit is useful in activating macrophages and strengthening the immunity, which then helps to produce more lymphocytes. It is also rich in antibacterial agents that combat infectious bacteria, including E. Coli and Staphylococcus aureus. Liver Protection: Noni fruit aids in protecting the liver from diseases. 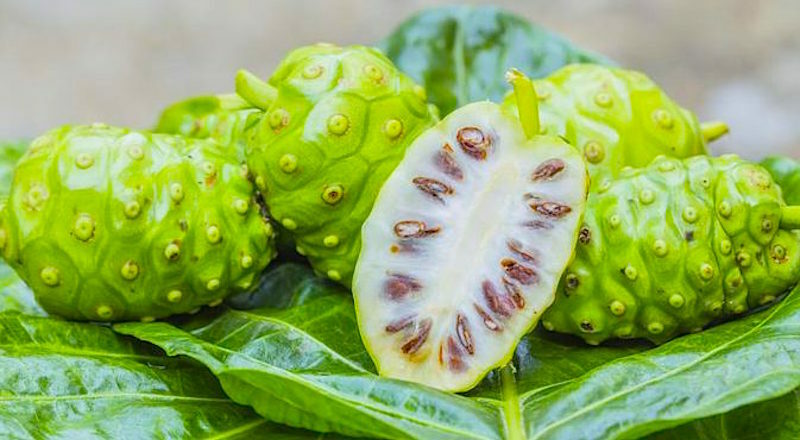 According to a study, noni fruit contains hepatoprotective agents on the liver, which gives the organ protection from the harmful chemicals and deals with liver damage. Reduce Arthritis: Noni provides relief from the problem of arthritis, as it comes with anti-inflammatory properties. Apart from that, it also contains analgesic properties that are effective at eradicating pain and reducing joint destruction from conditions such as arthritis. Skin Care: Noni is an excellent ingredient commonly used in skin care and beauty products. It contains protective chemical constituents that help stimulate collagen and inhibit the formation of wrinkles. Besides, it also possesses antibacterial and anti-inflammatory abilities, all of which are useful in combating various skin problems such as burns, acne, hives, and allergic skin reactions. It also helps to restore healthy and young skin. Toothache Reliever: Noni works to treat a toothache efficiently because it possesses antibacterial agents. The antibacterial substances directly eliminate the bacteria causing the swelling while the analgesic acts as a painkiller. Treat Diabetes: According to a research, eating noni fruit can reduce symptoms of type 2 diabetes. It shows that this fruit is useful in reducing the level of serum triglycerides, LDL cholesterol, and glycosylated hemoglobin in the body. Apart from that, it also encourages the glucose uptake and sensitivity of insulin. Noni is commonly sold in the form of juice and has a slightly bitter taste. They are sometimes made sweetened, unsweetened, diluted with grape juice or noni powder mixed with juice or water. It is most commonly marketed as a health tonic. Leave an unripened noni fruit on your kitchen countertop for several days until it feels soft. Use it before it turns white completely. Add the cold water to the blender and place the noni in it. Blend it and then strain the juice, to remove the seeds. You can mix it with a little water to drink. You can add some honey, if desired, or add a few slices of pineapple or orange to it. Noni fruit is very nutrient-dense and potent. In rare cases, it may cause problems for individuals with history of liver ailments and kidney issues. Also, it may not be safe for pregnant women. Noni is known to be used to cause abortions. If you are pregnant, please avoid consuming noni fruit. Avoid it even if you are breastfeeding. If you are on any medication, please consult your doctor before using any noni health tonic. Emily Pham is a blogger with over 10 years of experience in searching the effective remedies for skin care and health problems.